Do you use the Flag button in Apple Mail to tag some of your messages with a small red flag icon? This is a quick way to mark some messages so they’ll get your attention when you review your Inbox in the Mail application. 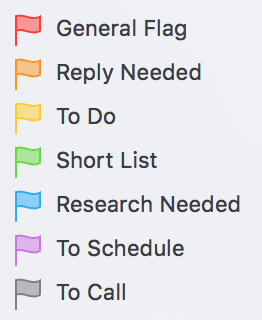 Did you know that Mail offers 7 colored flags? Did you know that you can assign custom names to each flag? Here are instructions for renaming the flags. It’s easy but not obvious how to do this since you have to first assign each color of flag to at least one email message. Click the Message menu, select Flag, and then click on one of the 7 flag colors to assign this color to the selected message. Repeat steps 2 and 3 for each of the remaining flag colors until you have assigned all 7 colors to one or more email message. On the left-hand side of Apple Mail click on tiny arrow that appears to the left of the word Flagged. This will reveal a list of all of the flags. Control-click on the current name of one of your flags and select Rename Mailbox. Is your Mac’s internal storage nearly full? If so, you may have seen an error message indicating that your startup disk is nearly full. I typically use OmniDiskSweeper to free up storage space on a Mac. One of the easiest techniques I use to free up some storage space is to remove backups of iPhones or iPads that haven’t been used in months. Use these instructions to remove iPhone of iPad backups that you no longer need which are taking up precious storage space on your Mac. Open iTunes by clicking on its icon on the Dock, if present, or open it from your Applications folder. Do you want to delete a backup of your iPhone or iPad from iCloud? There are two reasons you might want to do this. Sometimes, if one is unable to successfully backup an iPhone or iPad to iCloud, it’s because the current backup is somehow gumming up the system. By removing the existing backup then one is able to start fresh and successfully backup his or her device. If one has stopped using an older iPhone or iPad it’s possible that the last backup of this device remains in one’s iCloud account. If this backup is more than a year old then it’s highly unlikely that one would ever want to recover data from this backup. Thus one might be wasting storage space in one’s iCloud account. Should I Purchase Microsoft Office Outright Or Get An Office 365 Subscription? Have you received an email which starts off by listing one of your passwords and then goes on to indicate that a video recording of you watching an adult content video will be sent to your friends unless you pay a few thousand dollars in bitcoin? Please don’t believe everything you read. Emails like this are scams. The first report I received of this type of scam email was in July 2018. Soon thereafter this article about sextortion scam emails appeared on Sophos’ website. Sophos is a British security company. The one truthful part of the email is that the spammers do possess one of your passwords. If you still use that password, please change it anywhere you use it. If you’d like to be safe, please scan your Mac using Malwarebytes. If you consider this email as attempted extortion then please report it to the FBI using their IC3 (Internet Crime Complaint Center) web site, perhaps in the Internet Extortion section. If you’re like to read more about the history of this sort of scam read this article at The Parallax.